The Snowmass Ski Resort is part of the Aspen/Snowmass area. This includes 4 ski areas that are all located within about 15 minutes of each other; Aspen Mountain, Aspen Highlands, Buttermilk, and Snowmass. Where to stay in Snowmass, Colorado. Terrain park photos and information. Compare lift ticket prices and find deals. Photos from around the Snowmass area. The Snowmass Ski Resort is part of the Aspen/Snowmass area. This includes 4 ski areas that are all located within about 15 minutes of each other: Aspen Mountain, Aspen Highlands, Buttermilk, and Snowmass. 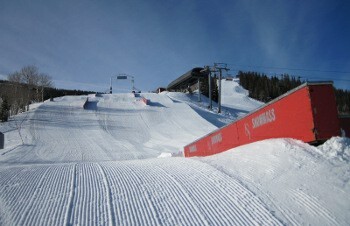 There are two main areas of Snowmass Village. These two village areas are connected by a free gondola that runs throughout the day and into the night. And there are trails for all types of skiers, from Beginner Trails all the way up to Expert Terrain. Snowmass village has lots of apres ski activities for skiers and riders to enjoy after they finish skiing. Be sure to check out Brothers Grille and the Big Hoss Grill when you are on your way through Snowmass.